I had a wonderful Jazz Night Out when I saw Richard Lopez and Bobby Floyd’s two piano concert at Otterbein with my parents and fellow writer Richard Sanford on Wednesday, February 17th. The program started with each pianist playing an exquisite unlisted solo piece, with Floyd’s offering establishing his physical, percussive approach to the piano. “Official” opener “All The Things You Are” set the theme of the evening (for me, at least): two of Columbus’ finest pianists running fascinating marathons through the intestines of the American Songbook while working together to create integrated performances. Lopez attacked the melody of Freddie Hubbard’s “Sunflower” with ferocity, but the final product still had an air of serenity. As with most of the pieces, both pianists took turns in the spotlight of Charlie Parker’s “Confirmation,” which culminated in Lopez and Floyd trading 4 bar solos so seamlessly that it was difficult to tell who was taking the lead at any given moment. Lopez started Chopin’s “Prelude Op. 28, #4” with a reverently classical approach, but Floyd soon joined the proceedings and eventually launched into a soulful double-time sprint. A staggered repetition of the melody was employed on Thelonious Monk’s “Well You Needn’t” to exhilarating effect, with each pianist always having a counterpoint to the other’s passage. Ballads were rendered in lively fashion by the two masters, highlighted by Lopez’s Latin-tinged style on “It’s Only A Paper Moon,” with a persistent left-handed rhythm that held sway until Floyd steered the piece to more traditional waters. Ahead of a well-earned encore, Floyd took the lead on his desired gospel finale, soulfully opening “Just A Closer Walk With Thee” before the duo took the tune to pounding heights. This concert displayed the under-acknowledged magic of two piano jazz! While I’m certainly locally biased, I would find it hard to believe that such a program of interlocking piano wizardry could be matched anywhere else. The album is in the mixing and editing phase as we speak! We have a big 67 hour session at Oranjudio this coming Friday to do final edits and get the levels that we like. Then, we are sending it off to our buddy in DC to get everything mastered. He’s the same guy who was the recording engineer for our first album. Album art is also in the works. A good friend of Eli is designing it. He also has a Dungeons and Dragons coloring book out. We’re really excited to see what he comes up with! We also have a huge project that’s still a little bit in the works. We wrote a tune for us and the Ohio University Wind Symphony that we will be playing at a concert on March 24th. According to the Ohio University rehearsal schedule they began rehearsing our piece this past Monday. Very very very very excited! Cover is $5 and music starts around 9pm. 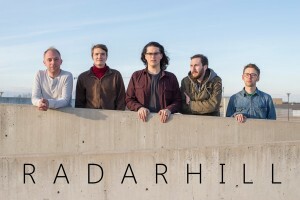 You can also catch Radarhill in their return to Jazz Wednesday at Brothers Drake on Wednesday, March 2nd, from 8 to 11pm. Friday, February 26th (8pm – midnight): Dave DeWitt TRio at Black Point, 570 N. High St. One of the newer Columbus members of the Hyde Park family of restaurants, having opened in October 2014, Black Point recently added Friday and Saturday night live jazz to their entertainment calendar. With similar programming to the Hyde Park Arlington location, Black Point is so far offering some of the finest classic jazz-styled local performers, including the hard-to-top TRio Jazz outfit of pianist Dave DeWitt, bassist Derek DiCenzo, and drummer Aaron Scott. Come down to The Cap for seafood, sushi and steaks paired with excellent live jazz. Sunday, February 28th (8pm – 10pm): Otterbein University Student Jazz Night at Bossy Grrl’s Pin Up Joint (North Campus). After a strong fall run, the often bi-weekly series of shows featuring Otterbein student musicians has returned for February and April installments at this burlesque-themed bar in the North (OSU) Campus area at 2598 N. High Street. This week’s show will feature saxophonist Korey Black, bassist Paul Baker, and guitarist Owen Hopper playing “a set of Stan Getz-inspired bossa nova tunes” from 8-9pm, and then the stage will open for a student jam session from 9-10pm.